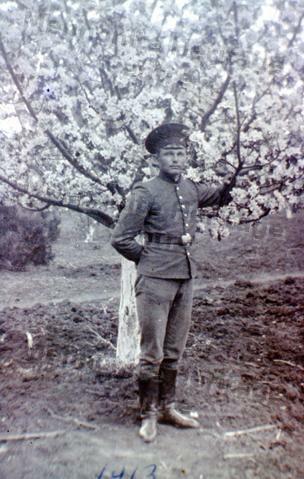 This photo shows a man from the forestry service standing in front of a blossoming fruit tree. The accompanying sound recording refers to him as our "Springsteiner Starshiy, initiator of these reunions". [=living in Springstein, Manitoba in 1972 and ranked as a senior officer] ?____ Dueck or Dyck.